Earlier today we shared reports that Miiverse is set to come to the 3DS "soon" and, in the future, receive dedicated smartphone apps. That information was from attendees at The Indie Games Collective event at the UKIE HQ in London, where Nintendo of Europe's Business Development Manager, Ed Valiente, gave a presentation outlining the welcoming policies in place for the eShop platforms. While quite a few of the announcements were previously known from various presentations and interviews by Dan Adelman and others on behalf of Nintendo of America, this was possibly the first notable occasion that similar details were divulged, publicly, by Nintendo of Europe. While we'll outline many of the details — and the reactions of attendees — in the coming day or so, there were some details from the presentation that haven't necessarily been focused on before when outlining the positive policies of the eShop platforms; the tweeting efforts from those in attendance have been revealing in that respect. One policy that's been visually evident — but is nonetheless worth pointing out — is that there are no paid-for feature slots on the Wii U eShop, with the goal that the curation and layout of the store is based on merit and fair coverage. Another announcement that hadn't necessarily been spelled out so clearly in equivalent presentations of recent months is that Nintendo is actively working to provide promo codes and 3DS eShop QR codes to developers to promote their work. Naturally these are copies that can be given to the press for reviews or used in contests, with Nintendo also offering support distributing these codes, which is surely invaluable for small studios yet to establish contacts. Much more was outlined as part of the effort of Nintendo in recent times to spread awareness of the benefits when publishing on the eShop platforms. Many of these policies earn plenty of praise when cited by competitors, so it's a positive that Nintendo of Europe is joining Nintendo of America in making noises to be clear that, yes, it's as open and supportive to small developers — potentially more so in some areas — as other platforms. That seems to be a good idea, it is kind of like walking into a store now, whichever brand catches your eye you look at more thoroughly. Now that is good news. Glad to hear that. What does paid slots means? I like this approach 'cause it keeps the front page fresh, as you won't see one or two games dominating the spotlight for ages because a major third party paid for them to be there. And i guess thats what turnes down a couple of "big fish" away from nintendo, because its not all solvable through money alone. And you can say what you will, there are certainly some hidden policys regarding DLC, so that things like seasonpasses, on-disc stuff and other rip offs are prohibited. Otherwise, i cant explain some of the big devs behavior in regards to DLC distribution on the WiiU. In other words: "screw the rules, i have money" was prevented and the big devs turn away from the system. If you ask me, its a price woth paying, even if it means lesser 3rd party support from bigger companys. I am glad there is no paid for slots. Should be really. One way for Nintendo to make money, and for committed devs to advertise their games. 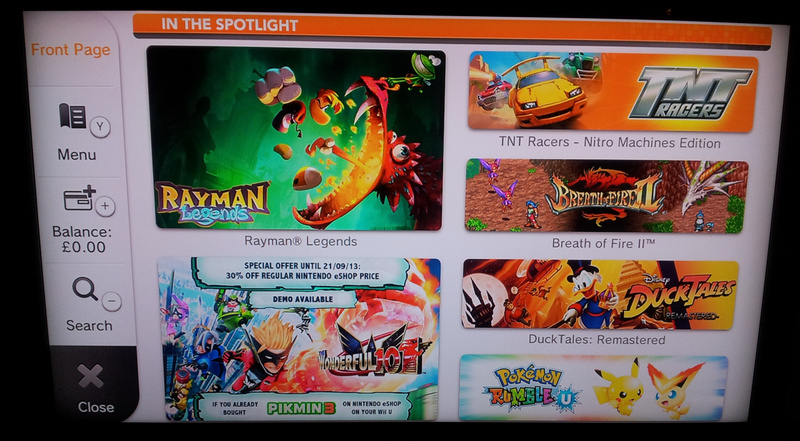 Just a small space near the top of the eShop for sponsored games. @Einherjar I think the type of stuff like paying for online again with a used game is what such as EA really doesn't like them not allowing. They put some pretty bad pay to win stuff into Fire Emblem. They are better than the other 2 for now. (Other than you can get a GOTY edition with all the DLC for 50% of the cost before too much time has passed.) If I get something I get the lot for better or for worse (Which is why I won't be getting Disney Infinity). Yet the PS4 is even more indie friendly and there getting big third party support. @cookiex Paid slot means the developer of the game has to pay to get featured on the front page and therefore get more exposure. This strategy earns the shop host (Nintendo in this case) some extra cash but at the cost of stifling indie development efforts who can't afford it because they can't get their game "seen" by the players who would buy it if they knew it existed. Nintendo is basically saying they don't play that game (see what I did there) and I respect them for it. @Einherjar @cfgk24 thanks for the answer. @Sony_70 good for the 0 ps4 owners. We are talking about a new player in the Indie selling are wish is having a extremely rapid growth in the digital are. Yesterday I went to the eShop to get D&D and I was amazed at seeing the evenness of the games featured. 2 Ubisoft games at the top (Rayman and Blacklist) and other sections have a first party game, then a third party game and so on. Not only Mario and not only Nintendo. I hope they keep improving. @Sony_70 The 3rd party suppord desnt have anything to do with the indie friendlynes. I stated above why i THINKS most big devs are turning their backs away from nintendos service. It has nothing t do with how friendly it is towards indie devs. @unrandomsam Sadly, i never played FE Awakening that far to really talk about the "pay to win" stuff and i generally understand the need for a subscription based online setup, since a good online setup is increasingly expensive. And if you ask me, im definitly willing to pay a small fee to avoid things like the incredibly unstable online lobby in MK7 for example. But thats not really what i meant. Its things like season passes, online passes, on-disc dlc so on and so forth. These are simply methods to snag more money out of the consumers pockets than neccessary. And im quite happy that something like that isnt present on the eShop and hope that it stays that way. @Einherjar Woah woah, hold on. Fire emblem doesn't have pay to win. Most all of the characters and skills you need are given in the main story. I am a huge fire emblem fan and never felt that I had to pay to get the best. Not to mention paying more will not save you from death on Lunatic or Lunatic plus mode. Just had to set that straight. "But... but.... but..... but Sony's got better indie games! But..... but...... but..... Sony's better!" Really? You come to a Nintendo fan site and THIS is what you want to express? As an option, the DLC in Fire Emblem Awakening was more than welcome. The fact remains the game was built to stand on it's own two feet, with or without DLC, and I beat the entire game on it's own. The only time "play to win" should be an issue is when the game is virtually unbeatable without paying more money. This is surely not the case with Fire Emblem. Nintendo heading in the right direction. @Macarony64: Basically, let's say you wanted to promote your game on the eShop and attract lots of people to it. A PAID SLOT means that you can pay Nintendo money to feature your game on the front page. Nintendo, however, just said that they won't be doing that, which is a good thing, because usually, the big companies with lots of money will heavily advertise their games, while the poor indie games barely get any spotlight. @Tuurtledove What were big third party developers before if not Indie developers? They don't suddenly just pop up and become immediately famous. They need to StreetPass me about sales or somehow make that clear without me having to go to the eshop. @NbaJunkie "Thats like going to gamestop and saying 'Arent you going to ask me if I want to preorder something!?'" Been coming here longer than you and my question was valid. (Despite misinterpreting what the OP said). Selling feature spots is a terrible thing. A better way would be to take a mix if new releases and fan ratings to make up the slots. But honestly more social services like Miiverse kind of take the impact of featured ads away. @Sony_70 Stepping back and looking at the comment made, noting the username, I hope you can appreciate how your valid point came across. I can which is why its more funny. A mod changed my name a year back when I was trolling sony and I've never got around to changing it. On topic i'm really liking nintendo's messaging as of late. They're taking cues here and there from other pubs on how to market their support of indie titles. The GDC and Ideame involvement are good starts. But more could be done to be honest. That is one of the reasons why I come to Nintendo Life. Every Monday (or Thursday) I can check all the downloadable goodies, and any discounts there may be. @sinalefa "That is one of the reasons why I come to Nintendo Life. Every Monday (or Thursday) I can check all the downloadable goodies, and any discounts there may be." Same here! But that only helps of you know about this site. It'd be nice if Nintendo did something to tell people that Trine 2 was 60% off without them having to go in to the eshop. Maybe even a scrolling banner on the plaza? I wish all the new games were featured up front. I felt that Giana Sisters got buried. I didn't even know it came out till I noticed the Community on the miiverse. @Sony_70 Establishing credibility is important if you want anybody to take you seriously. Though "trolling" and that name do the opposite of establishing credibility. The part about the free codes and possibly even helping to distribute them is great. @Interneto "You mean Spotpass". Yes. Yes I do. How was I trolling. I mean I get this is a Nintendo fansite but its pretty bad to talk about Nintendo in Vacuum. When i'm talking to my pro-xbox Guys I still mention how a horrible job Microsoft has done handling indies compared to Nintendo and Sony. Not sure my names lack's credibility, as much as the guys here who reference Nintendo in their names. @Einherjar Yea I know, I just don't want people to think badly of a game that got so much right and is definitely the best of the series. It also sold the 3DS to me since it was a system seller. Although honestly the idea of system seller depends on person to person. But youre absolutely right, its opinion and taste based. I'm glad that Nintendo is giving indie developers some love. There are some indie games that I consider to be quite good. I see this change also on Wii U main menù. I like this, i get informed of the most talked and most recent games without a big effort on my side. Hope the Miiverse on 3DS will work the same in adding a new 3DS main menù. It means you don't get to buy prominence on the shop page.